Facilitates development - Enhance your applications with powerful computer telephony (CT) features - no CT expertise required. 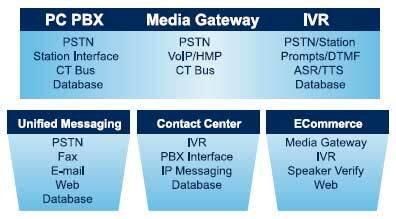 Seamless Integration with Intel-Dialogic - Easily interface your software with the entire Line of Intel-Dialogic Telephony Hardware. Shortens the development cycle - Alleviates the time consuming and often repetitive coding required by different APIs. Write applications only once - Deploy them on a variety of popular API or trunk types, in any country, with minimal changes. Lets you deliver new speech-based telephony solutions - Meet the growing demand for solutions such as voice portals and call assistants. Provides native support for speech recognition - Engines include Nuance, Philips SpeechPearl, SpeechWorks, and Microsoft SAPI. Enables Global Applications - Allow your application to be used all over the world. Supports regional language differences - such as British and American English, Latin American and Castilian Spanish. The Voice Ranger Computer Telephony Application Development Environment (CTADE) is a set of development tools and run-time environments that help shorten your time to market-and your time to revenue-by allowing you to build robust, portable CT applications quickly and easily. CTADE reduces the need to write directly to a telephony device's application programming interface (API) in C or C++. Because of its underlying architecture, CTADE eliminates the need for developers to learn new telephony hardware, APIs, and protocols. The CTADE architecture provides an abstraction layer that sits on top of telephony device APIs and performs low-level CT tasks, saving time that you can use to focus on building innovative applications. You can access the many features of the CTADE architecture by using CT-specific scripting language that includes a debugger. CTADE provides you with a specialized platform that reduces the repetitive tasks associated with traditional telephony application development-enabling you to stay focused on the most profitable aspects of developing your application. When you are prompted to run the program or save it, save it to your hard drive. The installation files are saved in a self-extracting zip file, CTADEv911Installer-38.zip. Once the file has downloaded, run CTADEv84.exe to unpack the zipped files. The Self-Extractor prompts you to specify a folder for the extracted files. Select a folder (usually it's a good idea to extract into a separate folder) and click Unzip. Finally, to start the setup program and install CTADE 9.1, run setup.exe from the folder you just chose for the extracted files. The CTADE architecture is object-oriented and mediates between telephony commands and underlying telephony hardware resources. With the CTADE architecture, you write your applications only once, even though they will operate with a wide range of telephony hardware, device APIs, and telephone network protocols. E-1/R2, and PRI. Before the introduction of the CTADE architecture, you had to write different applications or include conditional logic to handle a range of telephony hardware, APIs, and environments. When you use CTADE, you only need to learn a single set of easy-to-use commands, regardless of the hardware, API, or network protocol in your solution. For example, if you invoke the VOS function TrunkAnswerCall, the CTADE architecture determines which kind of telephony trunk interface you are using and which API function must be used to manipulate it: dx_sethook (R4 analog) or gc_Answer (R4 PRI). Intel is committed to keeping applications using the CTADE architecture portable to different APIs and trunk types as the industry evolves and programming needs change. Demand is growing for a new wave of speech-based telephony applications such as voice portals and personal call assistants. If you want to meet this new demand quickly, you need an intuitive way to speech-enable your applications. CTADE can help by offering native support for leading speech recognition engines including Nuance, Philips, SpeechWorks, and Microsoft SAPI. If you use one of these engines, you can call functions directly from applications built with CTADE. CTADE also allows you to make the most of advanced hardware features such as Continuous Speech Processing (CSP). SimPhone is an application that simulates a telephony board. You can use it to develop, test, and demonstrate your applications - even if there is no telephony board in your computer. SimPhone uses a WAVE-compatible soundboard to play voice messages, a microphone for recording (if your application needs to record messages), and a keyboard or mouse to enter digits to simulate a touch-tone phone. SimPhone is a unique product that allows you to develop, test, and demo your CTADE applications without a telephony card installed in your PC. Using SimPhone couldn't be simpler: just start SimPhone before before you run your CTADE application and your application will automatically use SimPhone instead of a telephony card. Prompts will be played on your WAVE sound card and, you can use the SimPhone pad to dial digits. To save screen real estate (which can be scarce when working in visual tool environments), you can check the Small option and SimPhone will shrink to a small icon that you can drag anywhere on the desktop. The icon continues to recognize your keyboard shortcuts for digits, Ring, and Hangupfast and easy. When you are prompted to run the CTADE evaluation or save it, save it to your hard drive. The installation files are saved in a self-extracting zip file, CTADEv911Installer-38.zip. Once the file has downloaded, run CTADEv83.exe to unpack the zipped files. The Self-Extractor prompts you to specify a folder for the extracted files. Select a folder (usually it's a good idea to extract into a separate folder) and click Unzip. Finally, to start the setup program and install CTADE 9.1, run setup.exe from the folder you just chose for the extracted files. CTADE is designed and tested for the Windows NT* , Windows 2000 and XP Pro* operating systems. Or click below on Questions and one our representatives will get back to you promptly.